Delicate strands on this kate spade new york necklace make a softer statement. Try it with a printed dress or even everyday jeans and a tee. 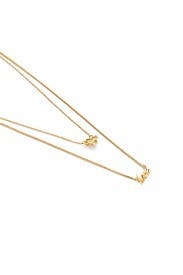 12K gold plated double strand delicate necklace. Lobster clasp closure. Inner strand measures 15" and outer strand measures 18'. 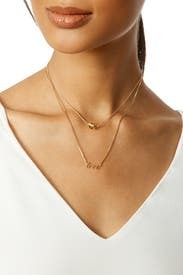 This necklace is beautiful yet simple. I wore it every day I had it. It's the perfect necklace to accessorize with when you don't want any kind of statement piece. Want to buy it and wear it all the time! Loved the layered look, stayed together nicely. Clasp was a little difficult due to short fingernails but not a problem. Considering purchasing this one! 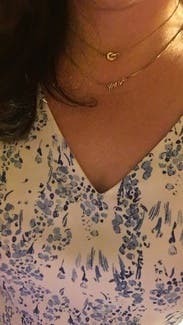 The necklace has an odd clasp. It was constantly getting twisted. Adjustable to how you want it to look ! Love this necklace. I want to keep it so badly I may just buy it. It's simple and perfect for every day wear. Loved this necklace. I wore it for days and wanted to keep it. Perfect day to day necklace. The "love" part is a little too long compared to the knot IMO, and it is not adjustable. Loved this necklace! Would rent again! Super cute nautical knot and love necklace. It hung high which I like for the stacked look. I wish the word love were a little bolder as it got lost easily. 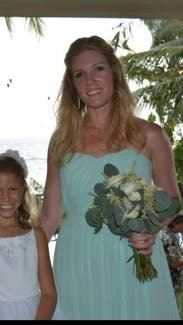 It was so easy to use rtr for jewelry to honesty my bridesmaid dress! The necklace was beautiful! I don't usually wear gold, which is why I rented my jewelry, but I enjoyed the tone of the gold on this necklace. I wish it was able to be made a little longer... I wore it at its longest and the shorter necklace fell right in the indent between my collar bones. I would have liked the longer closer to my dress me the short one where the long one was. But it worked and I got tons of complements. 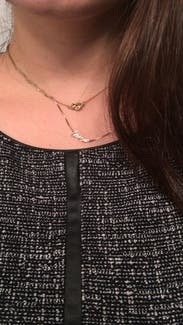 Perfect simple necklace to pair with sparkly dress! Two strands- one says "love" in script, the other is a love knot. 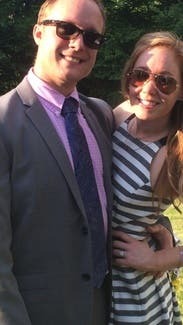 Would be very cute for a wedding. I chose this because my dress was super sparkly and I felt something simple for necklace would be the best match. It was comfortable and looked cute. Didn't try to compete for attention against the dress- exactly what I was after. Perfect necklace to compliment a minimalist dress. Wanted to wear with every outfit during rental. The LOVE was so Lauren Conrad! I loved these necklaces - I loved that the separated the most! The one looks like a fat pretzel so I detached it and just wore the "LOVE" one. 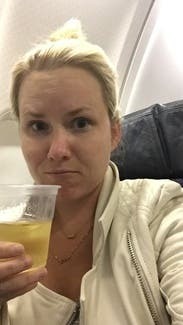 It was perfect for what ended up being my engagement weekend! Perfect for my wedding shower! So pretty and delicate with just the right amount of pop. 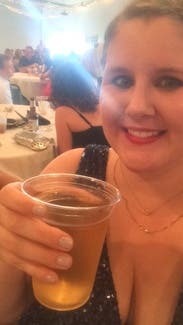 Everyone at my wedding shower kept asking where I got it. I rented this as part of my unlimited and really enjoyed it. 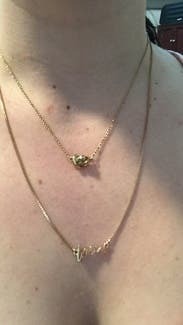 I love the look of layered necklaces but they are difficult to keep untangled sometimes. This necklace is great because the 2 layers stay separated well. And you can actually wear them by themselves in theory, though I don't think it's meant to be this way. I would consider purchasing this item to keep except I never buy gold plated jewelry since I find the gold wears off over time. That's the beauty of renting it from RTR! This is a classic Kate Spade necklace . I wish I could purchase it. I hated having to send it back . It hung just right for the v neck dress I was wearing! Ok sorry for the trashy selfie, but this is the best view of the necklace. I thought that it was a cute idea for a wedding since it says love and has a knot, but the two strands kept getting tangled around each other so I spent all night untwisting them, which was pretty annoying. Cute idea, but I probably wouldn't rent it again. I loved this necklace, simple but still sophisticated! 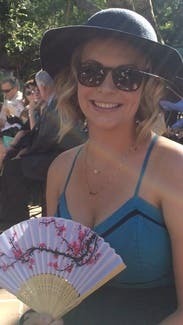 Very cute necklace for a wedding. Got a little tangled throughout the night, but still glad I rented it. I got this necklace through Unlimited and adored it. 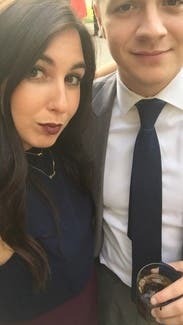 I wore it to a college graduation, to dinner at a nice restaurant and to work. Each time someone commented on its niceness/cuteness. These necklaces are delicate and sit well. You can wear one on its own or two together. The clasps are a little difficult to work but are not entirely unmanageable. 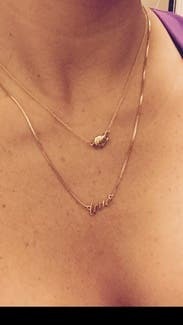 Just as many reviews have said this is 2 necklaces together and can get twisted. I chose to wear them together. There are 3 clasps making this possible to unhook without getting the necklace off. Best to have someone help you if you can. Great length for sweaters and other winter tops. 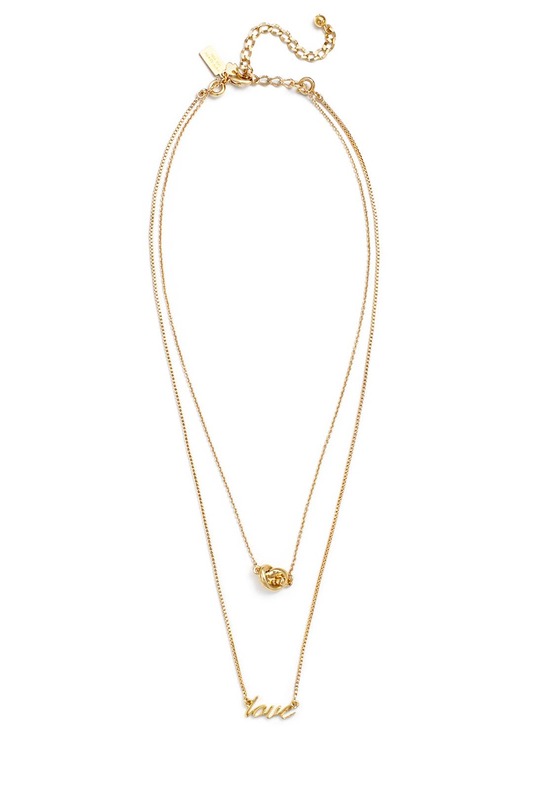 A pretty necklace that can be worn with virtually anything. Can be dressed up or down. A little annoying to take off or put on but stays perfectly in place once on. Highly recommend. I liked this necklace. It's simple but cute, especially for a wedding theme. I also like where it sits - in the center of the breast bone. The two necklaces can get a bit tangled & I did need help putting it on frequently. Great rent overall! Great necklace that goes with everything! So cute and sweet! I wanted to keep it!! 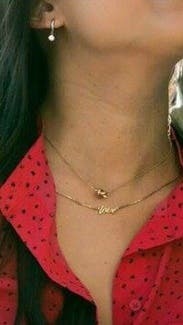 The necklace is so cute and sweet! It's very delicate and subtle. It was very light and easy to wear. You can actually unhook the knot necklace and wear them separately which is a nice option. Overall I was very very happy with this rental. Cute everyday necklace. Wish I had it for longer so I could have worn it! Wore this to go with one of my engagement photo outfits. It's a really pretty detail to have that's different from a single strand or a chunkier statement piece. Loved it! 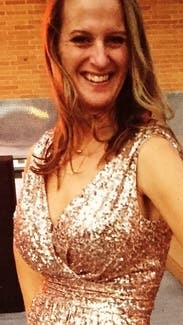 This necklace was the perfect addition to my halston heritage blush colored dress. The double chain looks super cool and the knot on the one chain and the love on the other fall right on top of each other and look great! Wore this as a statement piece to my sister's baby shower. A nice complex accessory that is subtle but very detailed. Got separate compliments on both charms! I wore this with the Slate & Willow "Envelope Sheath" dress for a Cinco de Mayo work function. The double strand was perfect & a great length wearing two necklaces in one! Give it a try! This necklace was delicate but a statement. I loved it to go with really anything. Very cute but took some help getting on. I really liked the knot necklace. I wore that separately as I didn't like the chain of the "love" necklace. 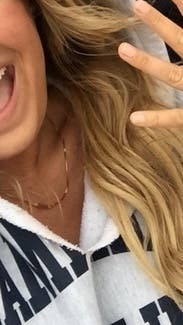 I will definitely purchase the knot necklace. It was a perfect size and design! Somewhat shorter than I wanted but it worked out great regardless.